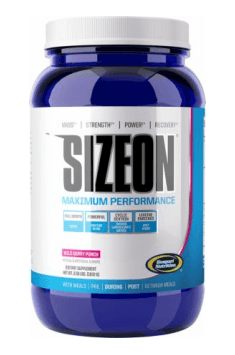 WHAT DOES SizeON MAXIMUM PERFORMANCE DO? What is the difference between SizeOn Maximum Performance and SizeOn Pre-Contest? SizeOn Maximum Performance contains the revolutionary OUTLAST carbohydrate complex for maximal performance in the gym and recovery and it contains pterostilbene to help push those carbohydrates (and amino acids and other nutrients) into skeletal muscle cells to maximize glycogen synthesis, cell volumization and myogenesis. * This formula is geared towards an athlete looking to "bulk up as fast as possible. "* SizeOn Pre-Contest does not contain the OUTLAST complex nor pterostilbene. What is the difference between the new version of SizeOn and the original? The new version of SizeOn contains high amounts of whey protein hydrolysate, leucine, along with more carbohydrates and pterostilbene. All in all, it is a much more advanced product based on cutting edge research. Can SizeOn only be used by bodybuilders or can athletes looking to build muscle mass and enhance their recovery use it as well? SizeOn can be utilized by athletes wishing for extra support to speed their recovery, build muscle mass, and increase performance whether in the gym or for athletic competition. SizeOn is designed to consume on a workout days WHILE a workout. Mix one scoop with 550 - 850 ml of cold water and sipping during a workout. If you feel the need for more hydration, you can add more water. Supplementation should be supplemented by a simpler creatine product in rest days. Depending on the length and intensity of the workout, the dose may be increased a little. (Grape Cooler): Malic acid, citric acid, salt, silica, natural and artificial flavors, acesulfame, sucralose, FD & C Red No. 40, FD & C Blue No. 1 (Orange Cooler): Citric acid, malic acid, silica, natural and artificial flavors, acesulfame, sucralose, beta carotene (dye) (Wild Berry Punch): Malic acid, citric acid, natural and artificial flavors, salt, silica, sucralose, FD & C Red 40, acesulfame. Pterostilbene is a modified form of resveratrol which is better absorbed by the body. It is a compound which may have a beneficial impact on detoxification process of the body, prevents the development of cancer and influences mitochondrial function, fat burning process and the function of nerve and muscle cells, which may be important to athletes. Studies have shown that pterostilbene is a strong antioxidant and that is why it may help reduce oxidative stress in the body caused by oxygen free radicals. It inhibits their oxidation by increasing the secretion of antioxidant enzymes. Scientists have also demonstrated that pterostilbene may have a major anti-cancer effect. It may inhibit the proliferation of melanocytes and block enzymes which activate carcinogens. It probably blocks the formation of prostaglandin E2 (PGE2) – a hormone involved in the initiation of an inflammatory response. Because of that, we can presume that it will be an effective anti-inflammatory agent. According to some sources, pterostilbene may stimulate the activity of fat-sensing complexes (caloric restriction), which results in a decrease in blood lipid and sugar levels and thus promotes body fat reduction. Results of one study have also shown that pterostilbene helps increase muscle gain and strength because it promotes anabolic processes. Protein Synthesis Acceleration Matrix, is a complex of ingredients, which accelerates anabolism, which includes biologically active ingredients: branched essential chain amino acids (isoleucine, leucine [approx. 5%) and valine forming BCAA) and hydrolyzed whey protein. BCAA is anti-catabolic and pro-anabolic, increases the expenditure of energy stored during the energy crises, reduces the feeling of fatigue and influence the activity of hormones and kinases involved in the metabolism of proteins. Hydrolyzed whey protein, as a result of breaking the long chains of the peptide, becomes easily assimilated. Magnesium glycyl glutamine (Glycyl Magnesium Glutamine, MGG) is an endogenous amino acid, synthesized in the body involved in myogenesis and detoxification of ammonia. It affects the maintenance of acid-base balance. It is a starting material of the neo-luconeogenesis process allowing glucose production and processing energy. Glutamine affects the proper functioning of the digestive and immune systems, and participates in the synthesis of glutathione, which is intracorporeal antioxidant. Magnesium glycyl glutamine (MGG) is a modern formula of glutamine by Albion, with high bioavailability and chemical stability, it is a component of pre- and post-workout and anti-catabolic supplements. Dosage: 3-5 g daily (higher doses acceptable in individual cases after consultation with your doctor or dietitian).